All equipment can be purchased from our online shop where there are professional reviews to help you choose what is best for you, all at the cheapest prices on the net. 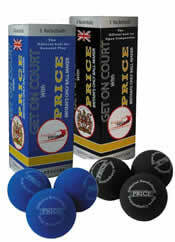 Click here to view the UK Racketball Racket Shop. Here is a very basic summary of how to play racketball, for a more in depth description see the video and racketball rules section below or click here for Mark Fuller's beginners guide to racketball. This guide covers all the basic shots, how to play them, basic tactics and how to construct a good rally. For more advanced advice click here for the "coaching tips" section. covering all the basic shots and strategies you will need to start developing your game and constructing good rallies. 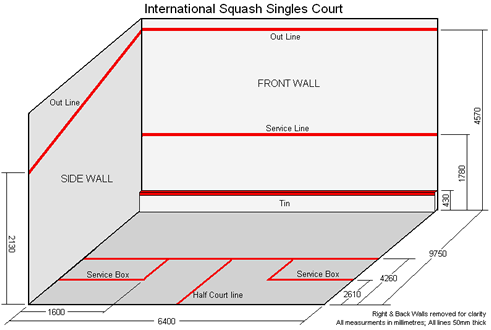 Racketball is played between two players on a regular squash court (shown below). The players use standard size racketball rackets and a standard racketball ball. The racket is spun to decide the serve. The server stands in either service box (5) and the receiver stands in the opposite back quarter (6). The server drops the ball to the floor and strikes it after one bounce. The serve can hit anywhere on the front wall but has to land in the back quarter in which the receiver is standing. If the serve is short of the mid court line (8) or if it hits the back wall first then the serve may be taken again. After the serve the rules are the same as for squash with the players taking it in turn to hit the ball. The rally ends when one of the players hits the ball into the "Tin" (7) or the floor, makes a mistake or hits the ball out of court above line (3). Scoring can be either to 11 with point per rally scoring or to 9 where serve must be held to score. Below are the rules of racketball in two versions. The first set of rules has been simplified so that they are quick and easy to understand so you can get started straight away. The second set of rules are taken from the governing body England Squash and Racketball. This is a simplified version of the rules specifically for beginners. 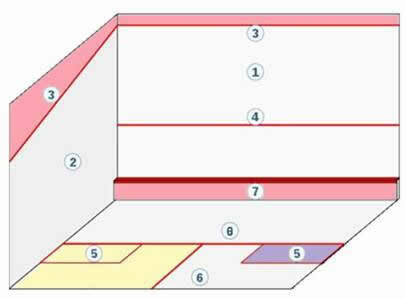 The Rules of Racketball: The 10 points and rules have been taken from England Squash and Racketball with added diagrams and notations. Here we have provided an article to help you decide which ball is best for you to play with. Balls can be either black or blue. The blue balls are more bouncy giving a slower game and the black balls have less bounce resulting in a faster game. Click below for more information on what ball to use. The difference between Racketball and Racquetball!? It is important to note that Racketball is very different from the US version of Racquetball and that they are spelt differently. In fact Racketball and Racquetball are two completely different sports! 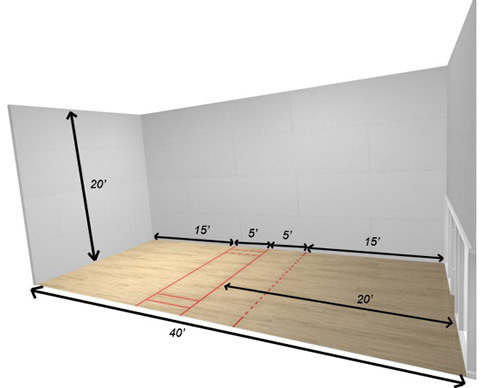 Racquetball is mostly played in America and uses a specific racquetball court and different rules. Racketball however is mostly played in the UK and as stated above uses a regular squash court and similar rules to squash. Below are the two different courts used. The ceiling and left side wall removed for clarity. UK-Racketball interview John Robertson “Robbo” Level 4 Squash Coach one of the founders of Racketball at the Manor Squash and Racketball Exhibition. We ask him how it all started, the reason for the decline of many clubs in the UK and how things should move forwards in the future.